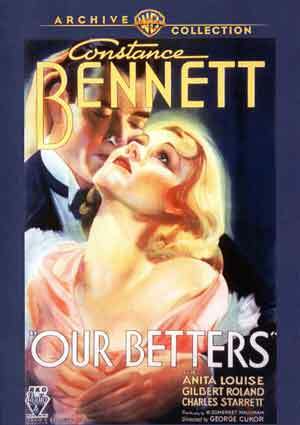 Our Betters is a charming little drama-comedy featuring a great performance from Constance Bennett, a woman ahead of her time and sadly died at the age of 60, though accumulated over 55 movies in her career. When American heiress Pearl Saunders (CONSTANCE BENNETT) marries Sir George Grayston (ALAN MOWBRAY), everyone thinks it’s a brilliant match. Sir George is delighted with Pearl’s money, and Pearl is in love with her new husband’s title in director George Cukor’s adaptation of W. Somerset Maugham’s biting stage comedy, Our Betters. Marital bliss quickly ends when Pearl discovers that Sir George has no intention of abandoning his philandering ways. She decides to match him affair for affair, plunging headlong into scandal and turning London’s high society into her personal playground. But when Pearl’s younger sister, Bessie (ANITA LOUISE), appears to follow Pearl’s example rather than her own heart, Pearl realizes they mistakes she has made. The movie comes to DVD through the Warner Archive Collection MOD program so the disc included is on DVD-R. Obviously this did not undergo any sort of restoration so there are numerous instances of dust marks, scratches and other flaws. The Dolby Digital Mono track isn’t much better, with pops and hisses permeates the track. Overall, Our Betters is a charming little drama-comedy featuring a great performance from Constance Bennett, a woman ahead of her time and sadly died at the age of 60, though accumulated over 55 movies in her career. This disc from the WAC offers adequate but very flawed audio and video transfers and no features.